Linking child profile from a device is a fairly easy step. After installation, you just have to sign in to your SecureTeen account, register your device for this account and link child for this account. 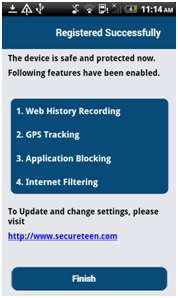 Launch SecureTeen by pressing the SecureTeen icon available on the Home screen of your device. If you already have a SecureTeen account registered, press the 'Existing User' button, provide your login details and sign in (Figure 2). If you don't have SecureTeen account yet press the 'New User' button, then go to sign up screen and fill out the form. Hit the sign up button (Figure 3). 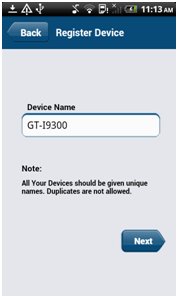 Provide a name of your choice in the Device Name field or leave it as the default device name. 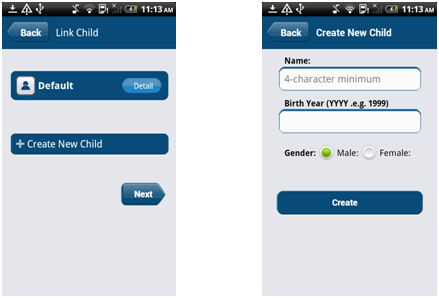 After registering your device, a 'Default' child will be created automatically. You can either use the 'Default' child or create a new one through the 'Create New Child' option. Here you need to provide your desired child name, birth year, and gender. After providing the information, hit the 'Create' button and it will take you to 'Link Child' screen (Figure 5) Now press Next. Once the child is successfully linked to the device, you will see 'Finish' screen which lists the features activated on this device; see Figure 7. Press Finish.